In February it's necessary to be looking ahead toward brighter, sunnier things, and so we're dreaming of April, daffodils, and National Poetry Month. Spring heralds the arrival of so many fantastic poetry collections, and these are the ones we're most anticipating. The latest title in Wilfred Laurier University Press’s Poetry Series is Certain Details: The Poetry of Nelson Ball, selected by Stuart Ross. In the pages of Gary Barwin's latest collection, No TV for Woodpeckers (April), the lines between haunting and hilarious, wondrous and weird, beautiful and beastly, are blurred in the most satisfying ways. Linda Besner’s Feel Happier in Nine Seconds (April) is a collection of poems in pursuit of knowledge and joy. In her second collection of poetry, Passage (out now), Gwen Benaway examines what it means to experience violence and speaks to the burden of survival. Roo Borson’s Cardinal in the Eastern White Cedar (March) is the latest from this Griffin Prize winner, completing her triptych of recent books. Stephen Cain’s new collection is False Friends (March), in which he takes inspiration from the linguistic term “false friends”—two words from different languages that appear to be related, but have fundamentally different meanings. Award-winning writer Anne Campbell releases The Fabric of the Day (April), a collection of new and collected poems. Tennille K. Campbell's debut is #IndianLovePoems (April), which humourously delves into the truths of love and lust within Indigenous communities. Acclaimed fiction writer and playwright Kate Cayley's second collection is Other Houses (May), whose poems interweave myth and legend with everyday life. Space Between Her Lips (April) is the first selected works of Margaret Christakos, edited by Gregory Betts. Karen Clavelle’s debut is Iolaire (April), the story of a 1918 maritime disaster. And John Creary’s debut collection is Escape From Wreck City (May), poems that capture the thrill of being fully engaged with the world, keenly observing each moment and event that constitutes being human. Pino Coluccio’s Class Clown (April) is described as “lyric poetry that is light without being frivolous, for people who are more punk than prog.” Xiphoid Process (April) is the latest from award-winner Kevin Connelly, nine years in the making. Mary Corkery’s Simultaneous Windows (May) is a metaphoric and narrative journey, both personal and political, in which rebellion, love and loss open windows to change. 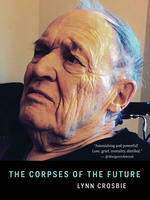 The Corpses of the Future (April) is the new collection by CanLit icon Lynn Crosbie, telling the story of her father’s battle with frontotemporal dementia and blindness, following a stroke. Lorna Crozier’s new book is What the Soul Doesn’t Want (May), poems that describe the passage of time and the quirkiness of the natural world. And singer-songwriter Rodney DeCroo's second poetry collection, Next Door to the Butcher Shop (May), explores the permeability of memory and uncovers heart-wrenching beauty from shadowy grit. Michael Dennis’s Bad Engine: New and Selected Poems (April) brings together revised versions of more than 100 poems by a “a natural heir to poets like Canadian icon Al Purdy and American legends Eileen Myles and Charles Bukowski.” Referencing the post-war neorealist film by Vittorio De Sica, Mary di Michele’s Bicycle Thieves (April) commemorates her Italian past and her life in Canada through elegy and acts of translation of text and of self. Award-winner Leanne Dunic’s debut collection is To Love the Coming End (March), a lyric travelogue/story with a Lost in Translation vibe. The poems in Wendy Donawa's debut, Thin Air of the Knowable (April), are grounded by the physical landscapes of Donawa's life life—West Coast, Caribbean, the Prairies—and reflect the inner-geography of the poet's preoccupations. And Michelle Elrick's second collection, then/again (May), is a poetic account of finding home, and the meanings and moments that the concept of home can embody. Jon Paul Fiorentino’s Leaving Mile End (May) provides a new framework for understanding what it means to be home in 2017. Rhonda Ganz's Frequent, small loads of laundry (April) brazenly mixes darks with lights and dares to peg out the quirky and bizarre, both real and imagined, with all seams showing. Lise Gaston's debut is Cityscapes in Mating Season (April), with poems that—from protest-filled Montreal to Vancouver’s property disputes—reach out to the textures of urban space, and interrogate facets of wilderness. The poems in Emily Izsak's debut, Whistle Stops: A Locomotive Serial Poem (April), occur over a series of train rides between Toronto and London, Ontario. Claire Kelly’s debut collection is Maunder (April), poems that allow the reader to “do their own idle walk across the page.” Trillium Prize finalist Aisha Sasha John’s new book is I have to live (March), a new collection ablaze with urgency and radiant inquiry. Mika Lafond’s My Way Back (April) moves between Cree and English creating a cultural dialogue that invests heavily in the poet’s relationship with her grandmother and her teachings. Ted Landrum explores the fertile gaps and overlaps between the architecture of poetry and the poetry of architecture in Midway Radicals & Archi-Poems (April). And Allison LaSorda’s Stray (April) shows a considerable range, conjuring childhood memories of beaches and ice cream, pondering the elemental force of the ocean, and plumbing the depth of loss in a coal mine disaster. A remarkable collection, The Dennis Lee Ommibus (April) collects writings from the many different parts of Lee’s extraordinary career. The poems in Joanna Lilley’s If There Were Roads (April) drive toward new vistas while reflecting on what has been lost in the process of moving forward. Jennifer Lovegrove, whose novel Watch How We Walk was nominated for the Giller Prize, returns to poetry with Beautiful Children With Pet Foxes (March), poems that attempt to make sense of a difficult and unsettling world. The poems in Lisa Martin’s new poetry collection, Believing is not the same as Being Saved (January) seeks the kind of lyric truth that lives in paradox. Award-winner Marcus McCann’s new collection is Shut Up Slow Down Let Go Breathe (May), poems that examine how we respond to overwork, anxiety, and overstimulation. Julia McCarthy, whose previous collection received the Canadian Authors Association Poetry Award, releases All the Names Between (April), poems that reflect the shadow-light of being, of what is and what isn’t, of the seen and the unseen, the forgotten and the remembered. Christine McNair follows up the much acclaimed Conflict with Charm (June), which considers the craftwork of conception from a variety of viewpoints—from pregnancy and motherhood, to how an orchid is pollinated, to overcoming abusive family relationships, to the manual artistry of carving a violin bow or marbling endpapers. Shane Rhodes’ Dead White Men (April) interrogates the stories of the dead white men that litter our histories and landscapes. The poems in acclaimed writer Clea Roberts' Auguries (April) are saturated with their northern landscape. Erin Robinsong’s first full-length work is Rag Cosmology (April), an urgent invitation to reinvent our modes of engagement with the environment we not only inhabit, but are. Prize-winner Sonia Saikaley’s A Samurai’s Pink House (May) takes its readers back to Japan in the time of Basho, and considers what his thoughts would be on the modern world and its treatment of women. And with Apocalypse One Hundred (April), Richard Scarsbrook’s poetry peeks over the event horizon to see the noise and distraction that bind us to this world. At times apocalyptic and other times passionate and intimate, Eleonore Schönmaier’s poems in Dust Blown Side of the Journey (April) show the beauty of the lived and natural world in both wilderness and urban settings. Jamie Sharpe’s Dazzle Ships (April) is concerned with art’s relationship to life and questions how we build poems from the material of mass culture. Susanna Showler’s Thing Is (March) is a collection of poems described as "startling and hip." Readers who loved Leanne Simpson’s Islands of Decolonial Love look forward to her new collection of short fiction and poetry, This Accident of Being Lost (April). And award-winner Michael V. Smith's latest, Bad Ideas (May) explores the inevitability of loss and triumph with characteristic irony and tenderness. Jennifer Still’s new book is Comma (June), created between 2008 and 2014, while her brother was in a lengthy coma, and Still engaged in a private collaboration with the art and wonder that was his handwritten field guide of prairie grasses. A debut collection, a place called No Homeland (April), by Kai Cheng Thom, draws equally from memory and mythology to create new maps of gender, race, sexuality, and violence. Phoebe Wang’s debut collection is Admission Requirements (March), poems that attempt to discover what is required of us when we cut across our material and psychic geographies. With Helpless Angels (April), Tom Wayman explores music via its closest medium, which is poetry. And Darryl Whetter’s latest is Search Box Bed (April), a collection of poems that explore the language of digital love.